We are a small, boutique agency with a limited number of clients. Our clients, in turn, have social profiles on 2-6 different networks each. At our current portfolio, we need more profile connections than most SMM can offer, but fewer than a massive enterprise option. eClincher is perfect for smaller agencies that can't justify the cost of some massive SaaS solution, but still need an SMM to save time and craft cohesive messages. It is bare bones and little harder to use than some of the other more established SMM programs out there. Because of that, there is a learning curve for people who aren't as familiar with computers. eClincher is better from an agency side, but may not be the best solution to resell to a client. Easily and quickly upload as many pieces of content as I want, rather than upload one at a time. The preview feature gives me great confidence that I know exactly what people will see when I post. Customer service is very responsive and quick to help. I can easily perform social listening to follow more than just my own platforms. eClincher supports nearly every social network and connects to a large number of sources (blogs, bit.ly, Google Analytics, Google My Business). This makes workflow tremendously easy. Posting Groups. At higher levels of service, eClincher allows you to set-up individual brand accounts. My agency isn't at that level, so we utilize eClincher's posting groups to make 1-click groups that post to all of the profiles for each client. This allows us to quickly post a cohesive message across all channels. Workflow management: eClincher adds plenty of additional tools to make your workflow fast. Connections to free stock photo services make it easy to add generic pictures to your content. Google Analytics and bit.ly can keep track of statistics and measure success. The Inbox allows you to handle all your clients' accounts from one screen (including comments, messages, reviews, and more). The Feeds and Influencers tabs allow you to understand your market and what's being said. 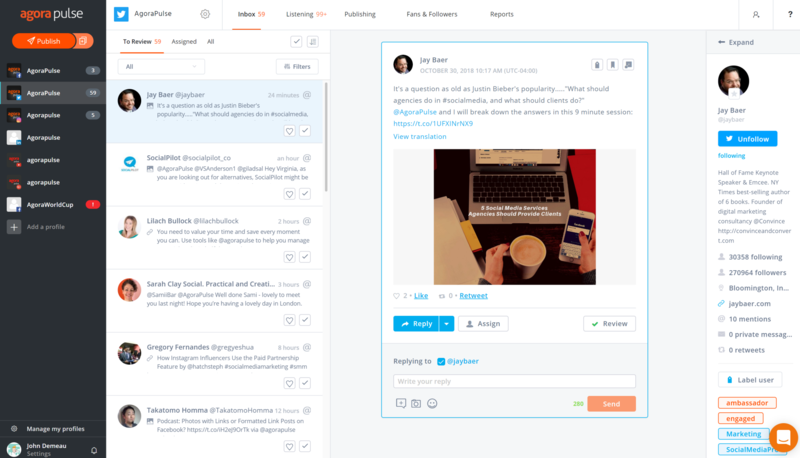 Altogether, eClincher makes a 1-app solution for Social Media Management. I would like to be able to post videos to Instagram via AgoraPulse and multiple images. Appearance: I don't mind the bare-bones look of eClincher (I like the functionality, and would rather have more functions than form). But, I think eClincher will continue to be a successful competitor to some of the bigger Social Media Managment SaaS with more attractive front-ends. Bugs: There are a lot of little bugs that pop up that make for less than seamless experience. Occasional lock-ups or form breaks that need a full refresh to reset are particularly noticeable, though not unexpected. The App is still new, so much of the usability and functionality is missing. Some additional development and UX/UI testing should improve the App functions. The decision has been made. It's time to get to work--no steps back. I feel confident this product is well suited to help me make progress. I want to get down business and utilize the functionality of this product to meet my marketing goals. I feel very comfortable with the choice I have made. Unless the price of eClincher moves to a point where it is too much to justify, I don't see any reason why we wouldn't continue to use eClincher for our agency. The value at this price-point is unbelievable and we'd be foolish to move to a pricier program purely for the sake of slicker graphics or UI. eClinchers pricing is fantastic, and is only matched by its functionality—it matches or beats any of the major Social Media Manager SaaS programs out there for a fraction of the cost. This tool is great for growing agencies, but would also be useful for any marketing department or large agency that wants to streamline their social media workflow. Assuming there are no weird bug that prevent the system from updating or registering your actions, eClincher is very simple to use. The posting function is pretty straight forward: select the channel or posting group to post to, insert content, and add to schedule. The posting function offers you lots of tools such as connection to free image services, import from pocket/feedly, attach file from computer, shorten link, or attach gif, among others. This makes it easy to create engaging content and then schedule it for multiple channels, all from one screen. Be patient. eClincher isn't perfect and has some software issues. These issues will be exacerbated if you get frustrated or have a slow connection. If something "breaks" or locks up, just refresh the page and re-do that step. It may take your team a couple weeks to get use to using the new system. Once they've gotten the hang of it, I'm sure they'll love the amount of time they save. I'd recommend taking your time with the set-up. Though there aren't a lot of steps to get everything squared away, you can break the process into small chunks to make sure you're managing your time. To just hook-up all the social accounts, it may only take an hour or so. But, if you want to set-up all the extra tools (such as user accounts, listening feeds, posting groups, schedules, etc.) it'll take longer. I think it took around a day to set-up completely, but your mileage my vary. In my quest to find the best Social Media Management software, I tried just about every service out there (scrolling through Capterra, TrustRadius, and G2 Crowd to find new programs). I was able to go for about 4 months on free trials alone and kept a log of the pros and cons, and weighed those against time saved and cost. Though there were many "prettier" options out there, eClincher had the most options at the best price point. It also had the best growth options for growing agencies. Scheduling a month's worth of posts for a single client would take 6-7 hours without AgoraPulse. Now we're down to about 90 minutes! AgoraPulse allows me to take on 3-4 times the number of clients I'd otherwise be able to handle. I estimate that I save around 5-10 work hours each month. It may be more, but I want to put a conservative estimate here. eClincher reduces the amount of time needed to post to each channel, collates all the notifications into one stream, and offers time-saving tools that streamline social media management for multiple clients. This saves me time that I can spend on other projects or client acquisition. Which in turn, could reduce costs for clients or my agency as a whole. Scheduled posting allows me to "bank" time (use excess hours or downtime to store posts for later time periods where I may be busier), but it also frees up my weekends and evenings with scheduled posts. Though some platforms offer post scheduling natively (Facebook), many others do not (LinkedIn, Instagram). This offers better time management (especially on fixed-hour contracts) and a healthier work-life balance.